Healthy Eelgrass Eelgrasses are critical to the Bay ecosystem. They provide habitat and nursery grounds for fish and blue crabs, serve as food for animals such as turtles and waterfowl, clear the water by reducing wave action, absorb excess nutrients, and reduce shoreline erosion. © J. Lefcheck/VIMS. Algal Overgrowth Excess nutrients from fertilizers, wastewater treatment plants, and other sources can fuel algae blooms that shade eelgrass plants by clouding the water and growing on the eelgrass blades. © J. Lefcheck/VIMS. Snails Healthy eelgrass beds nurture a diverse array of invertebrates like these snails that feed fish and other organisms in the food web. © J. Lefcheck/VIMS. The study—based on a comparison of VIMS’ 31-year record of seagrass abundance and the Chesapeake Bay Program’s long-term record of Bay water quality—appeared in the February 3 issue of Global Change Biology. Co-authors include Professor Robert “JJ” Orth and scientist David Wilcox of VIMS, Dr. Rebecca Murphy of the University of Maryland Center for Environmental Science, and Scott Marion of the Oregon Department of Fish & Wildlife. The team’s findings confirm a long-standing hypothesis that declines in Bay eelgrass stem from decreased water clarity, which in turn stems from increases in human activities that lead to nutrient pollution and sediment runoff. That might not sound like much, but given Chesapeake Bay’s gently sloping bottom, a 5-inch change means the Bay’s fringing eelgrass beds have contracted shoreward by more than 500 feet since 1984. In fact, says Orth, it is now rare to find eelgrass growing in water deeper than about 3 feet in Chesapeake Bay. At the same time, the analysis reveals that more frequent heat waves are impacting eelgrass populations even in these shallow-water areas. The most extreme temperature-related losses were observed in 2006, when eelgrass declined 58% following the sweltering summer of 2005, and in 2011, when the VIMS team measured a 41% decline following the steamy summer of 2010. One bright spot is that eelgrass is currently able to recover rapidly after these sharp declines. In the year following the 2005-6 dieback, eelgrass acreage increased by 55%, and by 2009 had reached total cover exceeding that observed just before the dieback took place. A similar rebound took place after 2010-11, with eelgrass returning to pre-dieback acreage in less than two years. The scientists warn, however, that future recoveries are much less certain given current trends towards murkier, warmer water. They also stress that their analysis focuses on eelgrass. Other underwater Bay grasses, widgeongrass in particular, have experienced recent increases in Bay coverage. But widgeongrass is known for boom-bust cycles that could quickly reverse these gains, and is unlikely to replace the ecosystem services provided by eelgrass due to its different growth habit and restriction to fresher waters. But it’s the combined effect of these two factors that gives the researchers their greatest concern. Says Lefcheck, “Declining clarity plus these hot summers is a real double-whammy for eelgrass.” That’s because eelgrasses—which already need more light to survive than related land plants—require even more light as water temperatures rise. The team’s analysis shows the mean summertime water temperature in the lower Chesapeake Bay has already increased by more than 2 degrees Fahrenheit since 1984—from 76.8° to 79.5°F—and that the frequency of extreme warm spells with water temperatures exceeding 82° has doubled in the last decade. As global warming continues to raise the area’s water temperatures—a conservative estimate is a further 3.5° F increase by 2040—the team predicts a further 38% decline in eelgrass cover. And if water clarity follows its current downward trajectory during the next 30 years, eelgrass would decline an additional 84%. When both declining clarity and warming are considered, say the researchers, the predicted increases in temperature and turbidity would result in a loss of 95% of Bay eelgrass—a near total eradication. An error bar chart will load here! To combat this downward trend, the researchers call on resource managers and policymakers to build recognition of global warming into their management strategies. “We propose that managers must increase their water-quality targets at the local and regional levels to offset losses caused by global factors outside their immediate control,” says Orth. 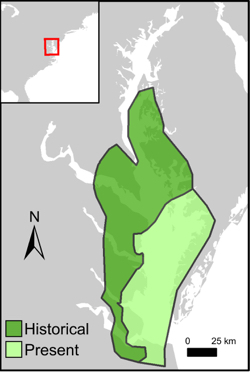 Funding for the study comes from the U.S. Environmental Protection Agency’s Chesapeake Bay Program, NOAA’s Virginia Coastal Program, the Virginia Department of Environmental Quality, and the Maryland Department of Natural Resources. Underwater bay grasses are critical to the Bay ecosystem. They provide habitat and nursery grounds for fish and blue crabs, serve as food for animals such as turtles and waterfowl, clear the water by reducing wave action, absorb excess nutrients, and reduce shoreline erosion. They are also an excellent measure of the Bay's overall condition because their health is closely linked to water quality.